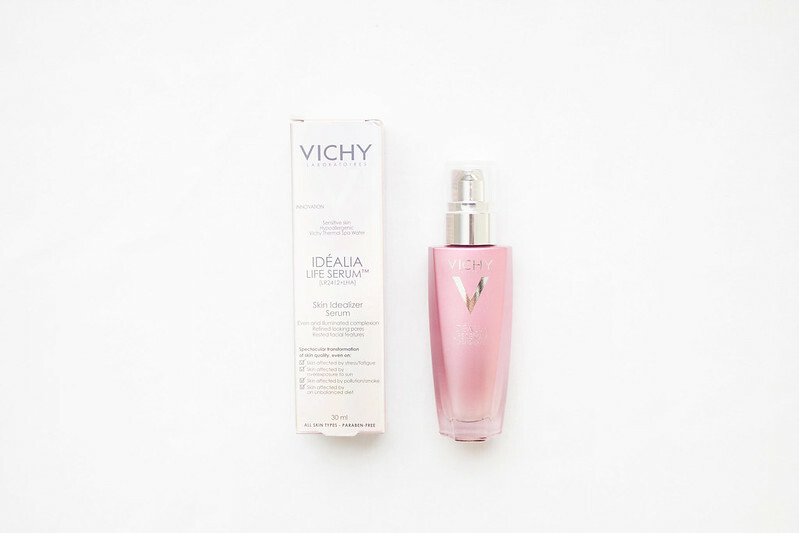 Vichy Idealia Life Serum was created to restore and repair the complexion of overstressed, overexposed, and unbalanced skin caused by pollution, stress, and poor diet. Any sallow and uneven skin is corrected while enlarged pores, oiliness, and dry patches are diminished. The formula is lightweight, non greasy, and fast absorbing; designed using the LR 2412 molecule, which alledgedly accelerates epidermal repair and improves the skin's ability to protect itself. Vichy Idealia Life Serum also contains Lipo-Hydroxy Acid, which stimulates cellular repair and exfoliates the surface of the skin to better reflect light and reduce pigmentation. I was pretty skeptical to be honest, I've never used a "repair serum" and wasn't entirely sold on the idea that I needed one. My complexion is generally blemish free with no dryness or oily patches, at best it can get a little dehydrated. Any product that claims to "spectacularly transform" one's complexion challenges me to find its flaws. Whilst I don't suffer greatly from environmental pollution, overexposure to the sun, cigarette smoke, or an unbalanced diet (all of which this serum claims to reverse the damage of), I can honestly say I feel Vichy Idealia Life Serum helps combat the signs of fatigue and stress. My complexion appeared less tired and draw, with the serum providing a more radiant, awakened complexion. Within a single day of use I noticed a difference, my skin was brighter, smoother, and looked healthier, plump, and glowing. The formula itself smells sweetly divine, it feels pleasant on the skin, and sinks in quickly without leaving a trace; my complexion was left looking radiant, naturally clearer and brighter. This product actually seems lovely and useful for anyone who suffers with skin that isn't absolutely perfect. I love this serum! When it first came out I was in Boots and one of the colleagues there seemed to like my ramblings about Vichy and thrust a handful of the samples at me. Of course it has since been repurchased since then. Adore. I really think I need something like this. I think because i've been travelling so much an the winter times my skin has gone all wrong. I have all red patches and look like I have leprosy - its glorious. Can I get this in Boots? I'll try and get some before I fly to Seattle methinks. I AM SO SICK OF FLYING PLACES. I've read a lot of positive reviews on this product. It will definitely be one I consider next year once I have used up a few things.